Having read Captain D. Michael Abrashoff’s first book, It’s Your Ship, I looked forward to his follow-up. Get Your Ship Together is the logical continuation of the principles from the first. In short, Captain Abrashoff took command of the destroyer USS Benfold. The ship was a consummate low performer in the preceding time before Abrashoff took command. Applying lessons in leadership, based on experience, military education, and common sense, the ship quickly grew into a high performing ship. The Benfold experienced a rapid turn-around and was a model for teamwork, morale, and achievements. 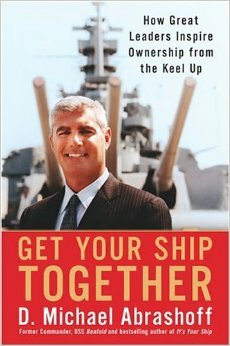 What separates Get Your Ship Together from It’s Your ship, is how Abrashoff veers off from his own military experience and uses examples from others. Leaders profiled for this book include an Army Lieutenant, a couple of CEOs, a Royal Canadian Mounted Police officer, a chemist, and a U.S. Navy Captain. Each section focuses on one of these individuals with some of Abrashoff’s lessons interjected within. Much of Abrashoff’s experience and examples are obviously military oriented, which can be quite different from leadership models and styles in the private sector. This book does a decent job moving away from pure military examples and styles, but at times Abrashoff seems to take control of the section. As the individual within that particular section tells their story, sometimes the story strays back to the USS Benfold under Abrashoff’s command. What I like about his style is that it’s not overly military, which allow his techniques to transfer to the private sector with great success. I have done this on the team of IT Analysts I manage. Personally, I identify with the styles and focus of Captain Abrashoff, but I can see where this book may not be for everyone. This book is full of anecdotes and stories that bring home the leadership lessons. However, this book is not the end-all, be-all for leadership as a theory and practice. The classics will always be the go-to for the intellectual study of leading teams and leadership principles, but sometimes it’s also good to read something light and fresh. Readers going into the book expecting a great tome of leadership and leadership principles will be disappointed. Those who want to see techniques that can emulate and employ in their organization can learn from it. If you’ve read the first book, you may not really need to read this one as there is not much new material. Rather, it contains mostly examples and lessons from the first book that are used by other people. As with all books on leadership and management, repetition is the key and reading lessons over and over in different formats, from different individuals will help to keep the lessons vivid and clear. This is one of those books. Nothing really new, but I still learned from it. I recommend it, especially if you have not read the first. If so, this is still a good read, but you may want to tackle others on your reading list first.